Looking for a lovely gift craft? 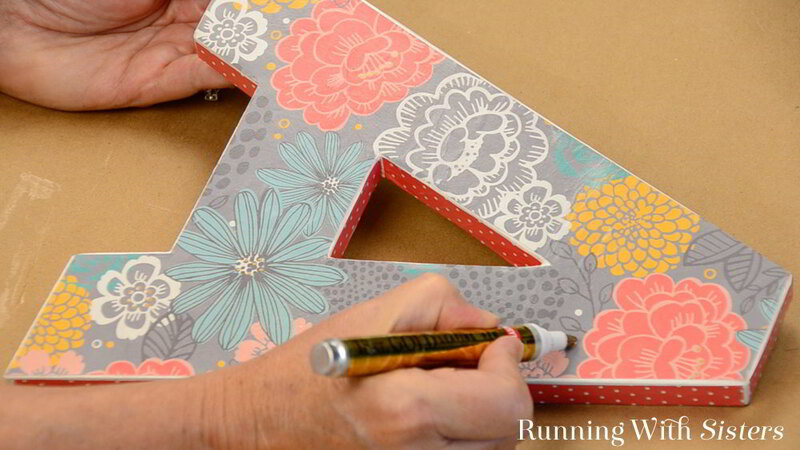 Decorate a wooden letter using Mod Podge. 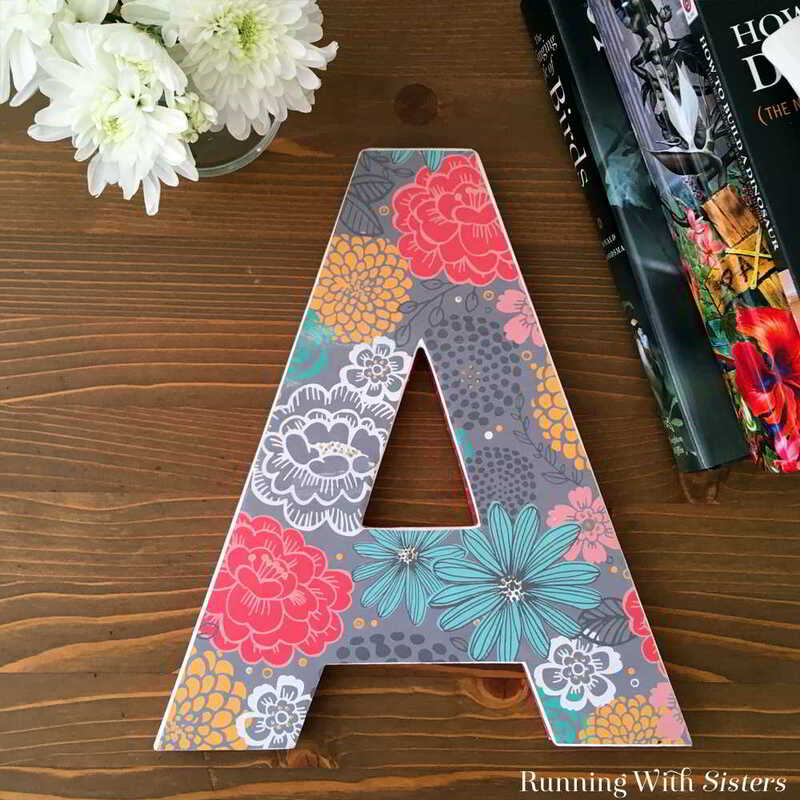 Decorative letters are so fun and trendy! You can make a letter for a baby boy or girl’s room or even spell out the baby’s name. We love the idea of spelling a word out to place on a mantel. We think HOME, BLESSED, or LOVE would make wonderful accents! We decided to do a letter A as a gift for our friend Alexa. So we chose paper that goes with Alexa’s style. For a baby’s room you could look at the pretty scrapbook papers with baby themes and colors. Just think about your recipient (or your own living room!) to pick out the colors and patterns to use. 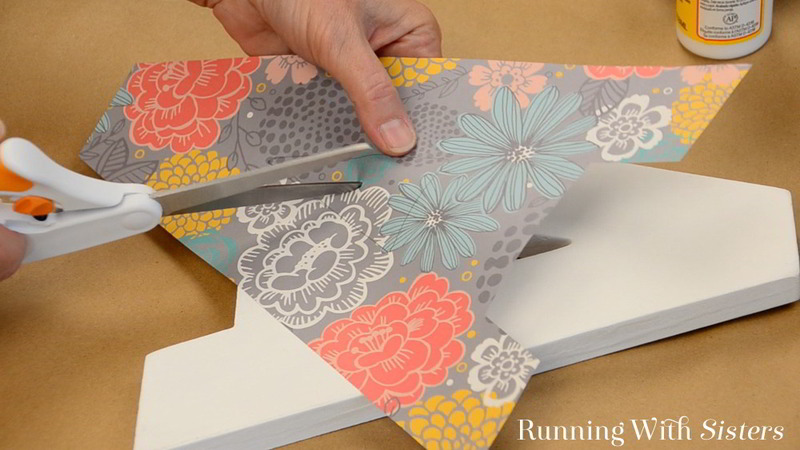 Pick out one piece of scrapbook paper to be the featured paper on the front of the letter. Then choose a coordinated piece for the sides. 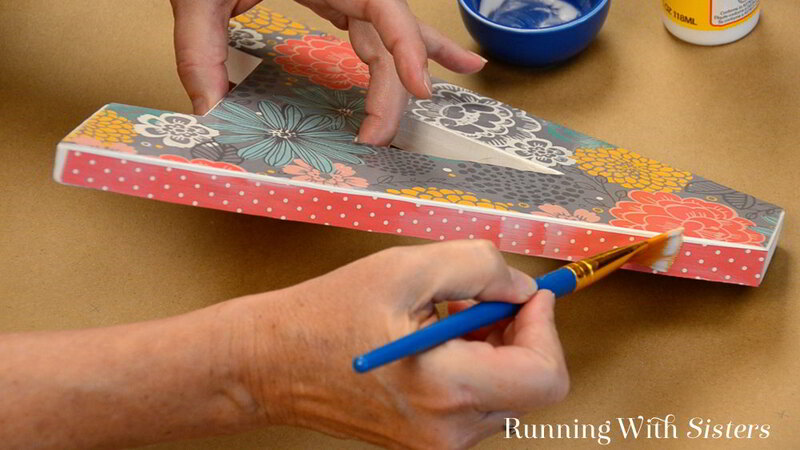 Here’s a video we made showing the whole decoupage process. 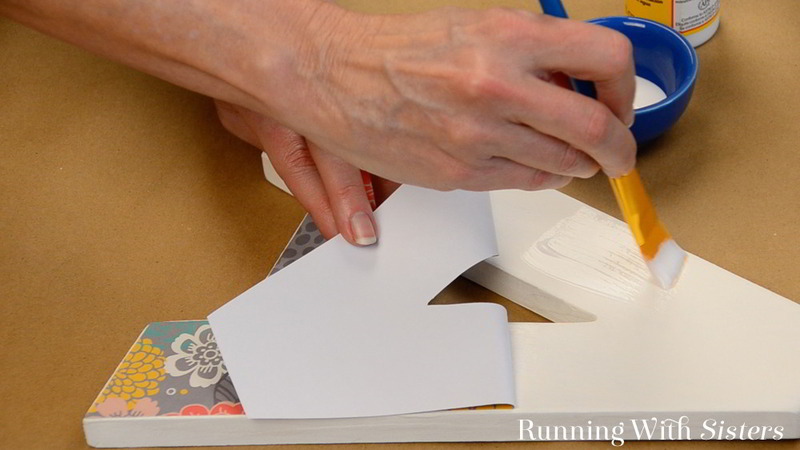 Watch it to see how we cut out the paper to fit the wooden letter, how we used Mod Podge to adhere the cut paper to the wooden letter, and how we finished the sides. We also have step by step instructions for you to follow. We are Plaid Ambassadors and get all kinds of wonderful paint and other craft materials from Plaid. We love their products and used their craft paints and Mod Podge for this project. 2. Cut the letter out of the paper cutting inside the pencil lines. Poke the scissors through the center of any holes you need to cut out. We think it looks nice to cut the paper letter a little smaller than the wood letter so a white border shows through. 3. 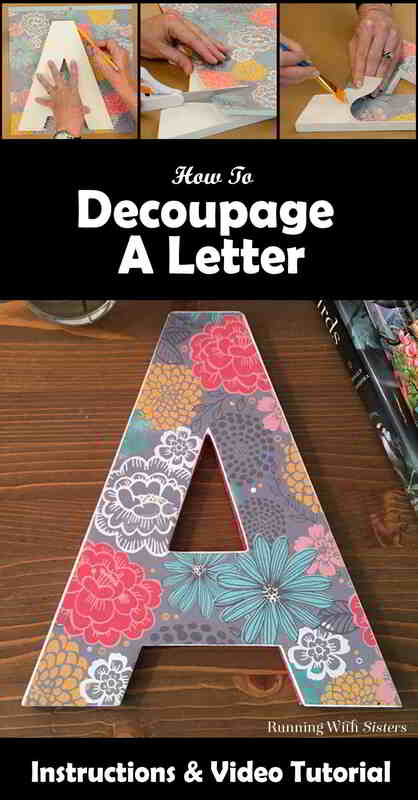 Lay the letter on its side on top of the coordinated paper. 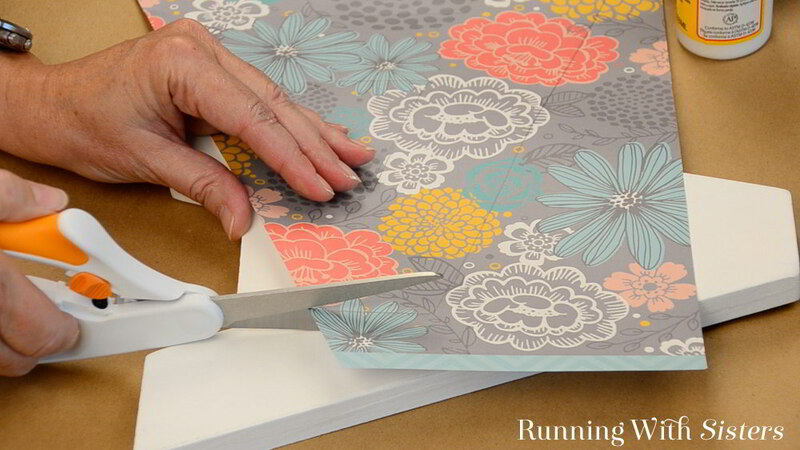 Trace the edges and cut strips of paper the same width. We will use these strips to decorate the edges of the wood letter. Cut extra strips the same width to glue inside the loops and curves on letters like B, D, and O. 4. Next, lay the paper letter on the wooden letter. Recut any edges to make the “border” (white showing through from the letter) even. Hold the letter in place where you want it. 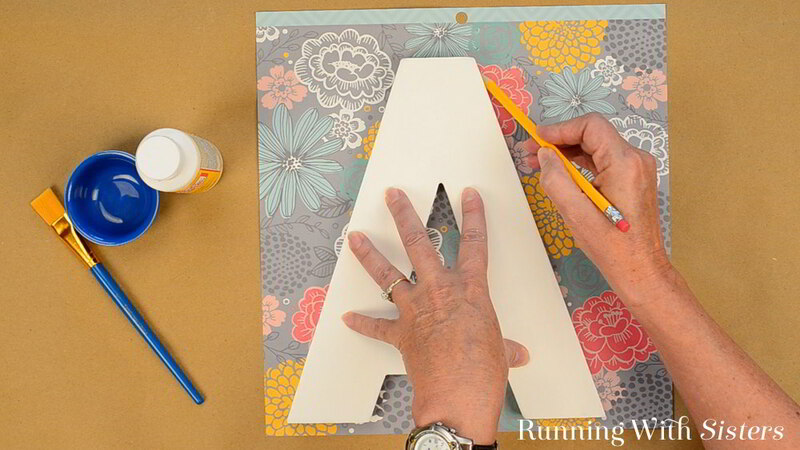 Then lift one end of the paper letter and paint a layer of Mod Podge on the wood. Press the paper down. Now the paper letter will be tacked down in place. 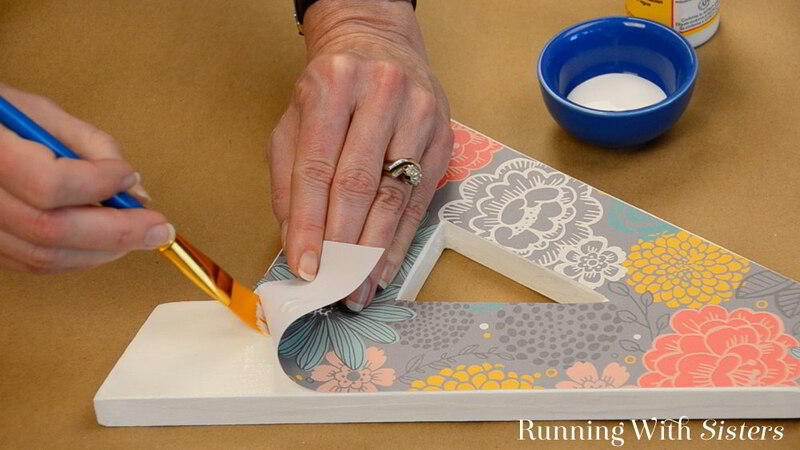 Lift the rest of the paper and paint a layer of Mod Podge on the wood. Press the paper down. Smooth out any wrinkles with your fingers as you go. Let the paper dry. 5. To decorate the sides, align the strips and trim as needed. 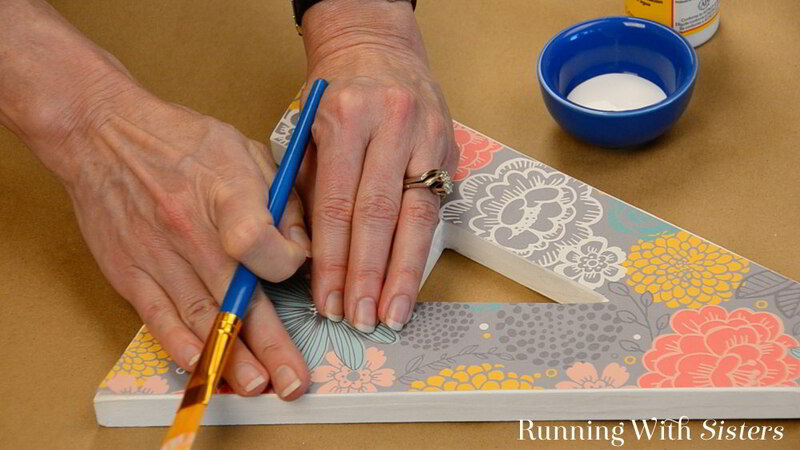 Paint the Mod Podge onto the wood first, as you did before, then press the strips down. Let these dry. 6. 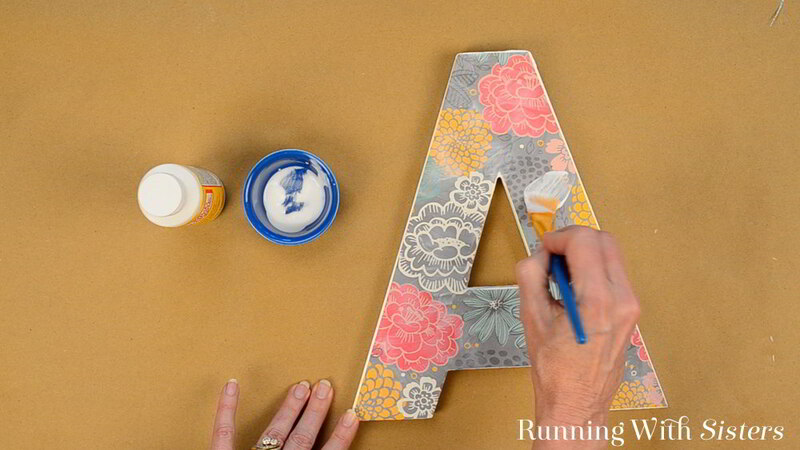 Paint a top coat of Mod Podge over the top of the letter. We like to do brush strokes in all different directions. Paint a coat of Mod Podge over the sides too. 7. We think it’s fun at this point to add a little extra pizzazz with a paint pen. We chose gold for our paper. We added dots to our letter by looking at the design and seeing where dots could go – inside the flowers, for example. If your design has bows on teddy bears, you could outline the bows. Just look for something in the paper design that you could add flair to with a little hand painted color! 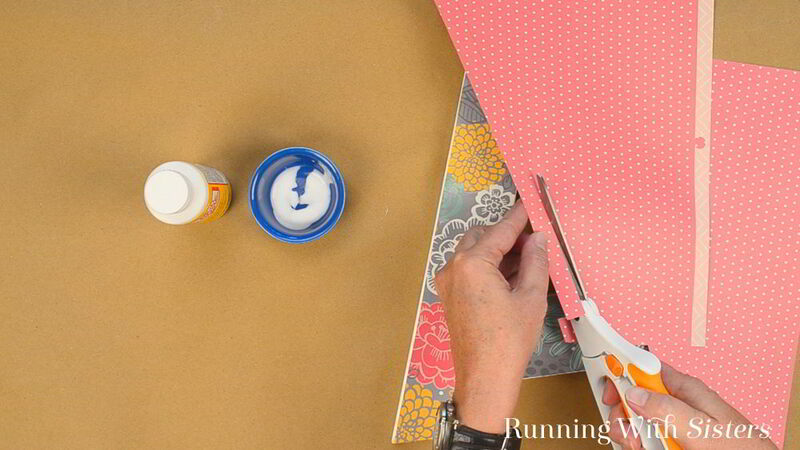 Isn’t this a fun decoupage project? So many options! A letter for a kid’s room, a name, or a word! Maybe even a phrase. Well, that might be asking too much! pretty cool idea, …they sell “wooden words” at any craft department,,,Even Walmarts….I love that even your “written tuturioals” are very details, but of course, the “videos are the BEST!” nice to just “go to them if needed between a project if I’m not sure of something(actual technique) Thank you! Thanks Christi! We think it’s made by SEI https://www.seicrafts.com/ but we can’t recall. We’ll dig through our scrapbook paper and see if we can find out. We just ran across the paper we used for this project! It is from a 12″x12″ scrapbook block called “Jen Hadfield Home+Made Best Of” made by Pebbles Inc. Hope that helps! Great question Mary! Yes. But if the printer is inkjet you will need to seal the surface with a clear coat of spray paint. If you use a laser printer, you won’t need to seal the image. Can you please tell me how to do the following. I would take cording, dump it into the jar of Mod Podge, take it out and spell out words (that I can adhere to the wall); but, onto WHAT do I place the words while it dries? ?